Sgt. 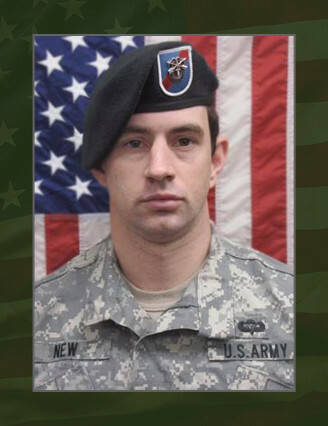 Stephen Michael New, 29, of Bartlett, Tenn., died July 28, of wounds received when his unit was attacked by small-arms fire in Kabul Province, Afghanistan. He was assigned to 2nd Battalion, 20th Special Forces Group (Airborne), Jackson, Miss. He was deployed in support of Operation Enduring Freedom with 3rd Special Forces Group (Airborne), Fort Bragg, N.C.
New joined the Army in August of 2003 as a health care specialist. While on active duty he served with Headquarters, 75th Ranger Regiment, Ft. Benning, Ga, until leaving active service in 2005. His military education includes One Station Training, U.S. Army Airborne School, the Warrior Leader Course, the Advanced Leader Course, Survival, Evasion, Resistance, Escape Course and the Special Forces Qualification Course. New’s awards and decorations include the Bronze Star Medal, Meritorious Service Medal, Purple Heart, Good Conduct Medal, Afghan Campaign Medal, NATO Medal, National Defense Service Medal, Non-Commissioned Officer professional Development with numeral 2, Global War on Terror Service Medal, Army Service Ribbon, the Parachutist Badge , the Combat Infantry Badge and the Special Forces Tab. He was posthumously promoted to Staff Sergeant. He is survived by his parents and his sister.